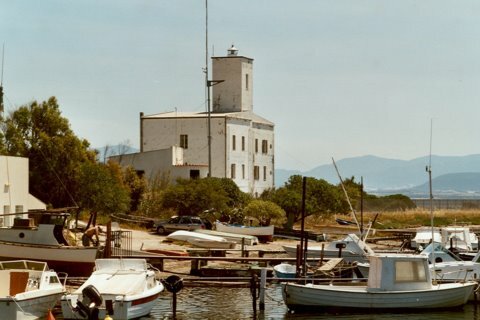 The island of Sant Antioco is located in the extreme southwest part of Sardinia and connect with the "mainland" via bridge. It is the biggest island of Sardinia. This island is characterized by it's absolutely uncontaminated nature, simple vegetation like juniper and olive plants. Flat limestone and sparse volcanic cliffs, caves and small inlets complete the romantic impression. All in all it's animal world is still intact. Rare birds species have got their home here. Because of it's secluded island position the sea water is crystal clear and emerald blue, uncontaminated and a favorite spot for all kinds of water sports. 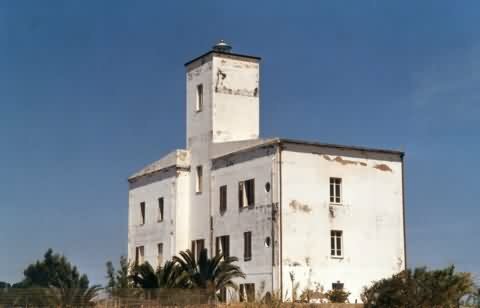 The lighthouse sits on the northern end of San Antioco. From the town of Cagliari, get onto SS195 and follow it for about 68km until it meets up with SS293, coming in from the right. At that intersection, turn left and stay on SS195 for another 14km. At the intersection with SS126, turn left onto SS126. Follow SS126 for about 8km until you go over the bridge onto Sant Efisio. Once over the bridge continue on SS126 for about 2 km until you get to the intersection with SS126D. Turn onto SS126D. Follow it for about 10 km. At that point you'll get to the town of Calasetta. From there it appears to be small local roads (with no names on the map SW), so ask how to get to the tower.